1,300 law enforcement personnel during Prison Break 2015— the rain-drenched, three-week manhunt in remote Adirondack forest- land — show Wells Communications at its best. From its offices at 4338 NY Route 22, Plattsburgh, the company works flawlessly behind the scenes to deliver dependable communications, at all times, lead- ing to an increase in public safety. Offering state-of-the-art Motorola wireless systems, security cam- eras, pagers, and other communication and surveillance technology, Wells Communications designs, installs and maintains 9-1-1 sys- tem equipment and other emergency service systems for police and municipalities in Clinton, Essex, Franklin, St. Lawrence, Jefferson, and Lewis counties. It also provides equipment and services to local first responders, most of whom are volunteers, as well as to school districts, health care, manufacturing, and the private sector compa- nies throughout the North Country. 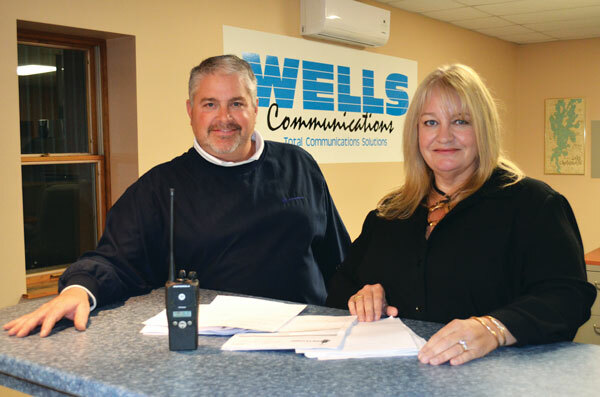 Wells Communications began in 1950 near Troy, New York when North Greenbush resident Bill Wells, who had been fixing radios and TVs in his basement for years, became an independent autho- rized Motorola service center. When Ed Kehn, Sr. and son Michael, purchased the business in 1976, he kept the name, and continued to successfully service customers as Motorola added pagers and cell phones to its sophisticated line of radios. A decade later, Kehn pur- chased a Plattsburgh Motorola dealer, Ben’s Communications, and established Wells Communications in the North Country. Kehn, now CEO, recruited his other son, Ed Jr., to return to the family business where he is now the president. In 1989, as the business continued to grow, Mike Milanese moved from his technical position in Troy to sales in Plattsburgh, and eventually, to the role of company vice-pres- ident. Maureen Kehn Milanese returned to day-to-day operations in 2002 after the passing of her brother, Michael. Wells Communications provides elemen- tary and high school buildings, buses, and administrators with pagers, two-way radios and surveillance cameras to improve safety, accountability and communication among the people charged with teaching, transport- ing and providing safe schools for children. In fact, due to Wells’ Motorola equipment, all school buses have a direct channel to 9-1-1. In addition, Wells has provided emergency communication systems to many college campuses.